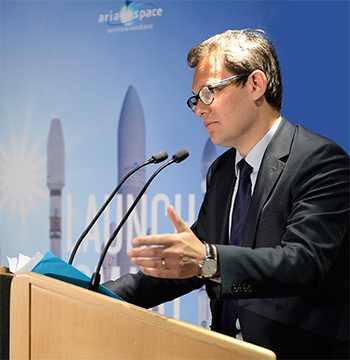 Chairman & CEO Stéphane Israël speaks to an audience of international reporters during Arianespace’s Paris Air Show press conference. Arianespace’s mission track record during the past two years – along with steps taken to ensure its flexibility, reactivity and competitiveness – will enable the company to remain a launch service leader as the global market continues to significantly evolve. This was a key message from Chairman & CEO Stéphane Israël today – who spoke with journalists at the Paris Air Show – using the two years since this biennial aerospace event’s previous gathering as a benchmark to measure Arianespace’s transformation. From the operational point of view, Arianespace’s capability was clearly demonstrated during the past 24 months with its Ariane 5, Soyuz and Vega launcher family from the Spaceport, he told international reporters at Le Bourget Airport. Further enhancing the Spaceport’s capabilities will be its fueling facility for Soyuz’ Fregat upper stage, which is to be inaugurated next month. He added that Arianespace remains on target to perform 12 missions in 2015 – building on the record 11 flights performed last year – dependent on factors that include satellite availability. On the commercial side, Arianespace logged 22 launch services contracts for payloads to geostationary transfer orbit (GTO) since the 2013 Paris Air Show – a period marked by the emergence of geostationary satellites with electric propulsion, as well as a newly-dynamic market with satellite constellations for Earth observation and connectivity. “In this environment, we succeeded in re-balancing the order book between large and small satellites for Ariane 5 – which is vitally important for us, going from two-thirds large satellites to an equal mix, which is important for matching up passengers in our dual launches,” Israël explained. For the non-GTO market, Arianespace’s latest family member – the lightweight Vega – marked key successes, logging 11 contracts for nine launches since the Paris Air Show in 2013, while two contract bookings were made for Soyuz and two other contracts were signed for payloads on Ariane 5. In preparing the future, Arianespace has taken steps to introduce cost reductions in terms of its current launcher family operations, providing additional competitiveness ahead of subsequent introductions of the Vega-C version and the next-generation Ariane 6. Additionally, the shareholder refoundation confirmed today is an important move toward the development and introduction of Ariane 6, and will ensure the continuation of Europe’s independent access to space.